Are you late for the most scary night of the year? 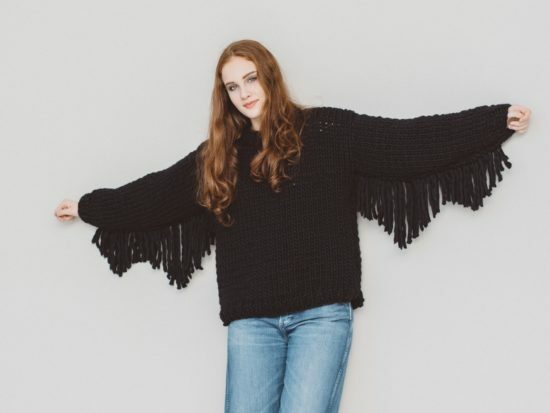 No fear, with the “Nightmare” Tutorial that Gaia Segattini has made for us, you’ll have in no time Bat Wings for Halloween and thus renew a simple black sweater. 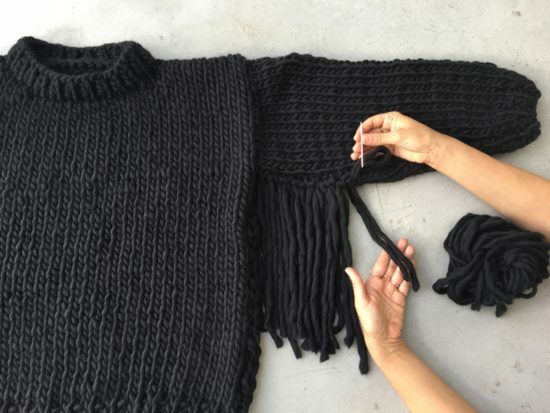 The base is our Forever Sweater, a contemporary sweater, “boxy” fit and therefore slightly oversize, to suit everyone. the kit includes the natural beechwood knitting needles, 6 balls of Cool Wool, 100% Peruvian wool and the pattern. 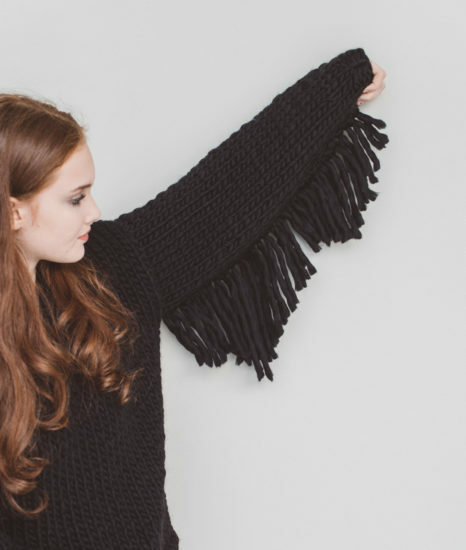 At the bottom of the sleeves were added fringes and then cut to form Bat Wings. It’s a customization that will be perfect for Halloween but the most daring ones can even show off on a daily basis! What do you need to make Bat Wings for Halloween? Once you have gathered all that’s needed, you’re ready to start! 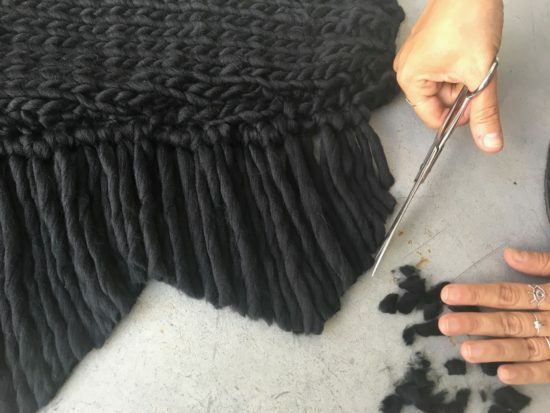 Cut so many strands of yarn, each about 60 cm (24 inches) long. 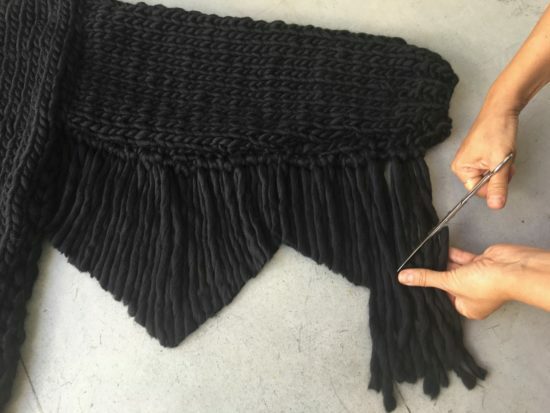 With the help of a sewing needle, tie them with a knot along the undersleeve seaming. Follow all the steps as shown in the picture below. Continue until you have completed the entire sleeve. After that, start to shape the bat wings. With scissors, cuts the fringes forming tips: a bigger tip near the side, a smaller tip near the cuff. Continue to realize the second tip, smaller, that will end near the cuff. Here it is! A sleeve is ready! You can now proceed with the other sleeve: the spectacular effect will be assured! 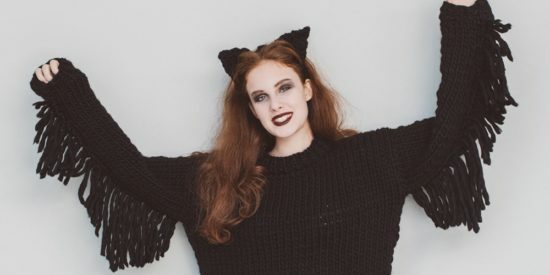 But do not forget a proper make-up, crocheted cat ears, and you’ll be ready to show off real Bat Wings for Halloween!